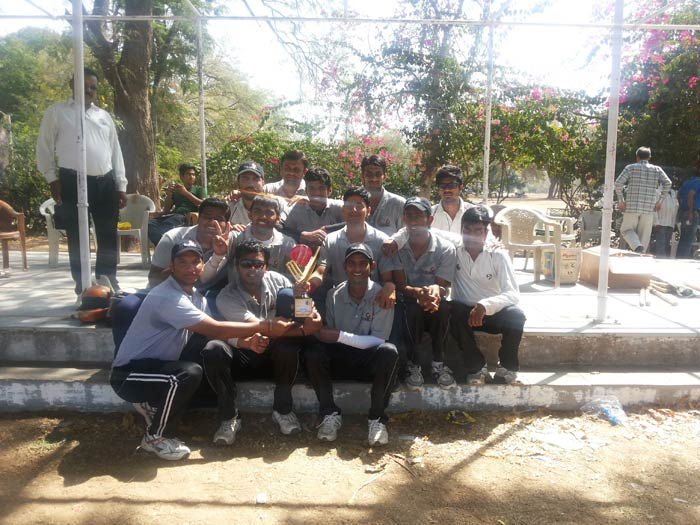 Adding another feather to its crown, IndiaNIC bagged the title of ‘Pancham Corporate Cricket League Champions’. The team IndiaNIC were on pins and needles to play the final match against Sadbhav Engineering and looked enthusiastic when arrived on the ground. As the luck would have it, the captain Mihir Raval won the toss and chose to bat first. The opening batsmen Naman Shah and Kushang Modi stuck to the wickets as glue and contributed whopping 97 runs making every plan of the opposite team out of kilter. Naman just had a run short of his half-century when got caught-out. On the other hand, Kushang Modi managed to hit bowlers with no mercy. Both the batsmen made opposite fielders run all across the ground hitting two sixes and six fours. As the opening batsmen had already put the team on a powerful stand, the rest of the top-class batsmen would certainly take the score to the next level; one could make no bones about it. And it happened – the following order of batsmen Mayur, Mihir, Kadam, Sandip and Mohsinali did add a respected score of 160 runs playing the total quota of 20 overs. All the efforts of Sadbhav Engineering seemed trivial as they could not stop runs coming. After setting the score of whopping 160 runs, the opposite team was already on thin ice. IndiaNIC’s bowlers were rarin’ to go and get the opposite batsmen out. All bowlers bowled smartly and were able to get wickets as planned. The whole team was cheering every wicket they got. While Yogesh and Sandip got a couple of wickets, Tejas and Naman managed to grab one each. On the other hand, after losing crucial wickets, the camp of Sadbhav Engineering started finding the whys and wherefores of their downfall. As the match progressed, the batsmen on the pitch seemed like giving up the match taking a dim view of achieving the mammoth score of 160. The only batsman Parth Agola could hold the one end of the wicket and remained as a witness of the downfall at the other end. Parth’s torpid innings earned him a half century but the victory of IndiaNIC stole his thunder. The team of Sadbhav Engineering was packed in 97. IndiaNIC players cheered the victory and the organizers tapped each player’s shoulder for their untiring performance throughout the tournament. Naman Shah was declared as the Man of The Match for his spectacular innings.